I'm dating myself horribly when I tell you that one of my earliest crushes was David McCallum's character Illya Kuryakin on The Man From U.N.C.L.E (1964-1968). Cultured, brilliant, mysterious and oh, so handsome; how could I resist? For the last 12 years, McCallum has played medical examiner Dr. Donald "Ducky" Mallard on NCIS. I hear that's the most-watched TV drama, worldwide, but here's a confession: I've never seen the show. I know, right? It seems like it's mandatory––for all Baby Boomers, at the very least. I'm a little worried that this will disqualify me from Medicare coverage. We'll see. Anyway, to me, McCallum will forever be that devastating young man of my youth. But now I have another way to view McCallum: crime fiction author. This week saw the publication of his first novel, a crime thriller titled Once a Crooked Man (Minotaur Books, January 12, 2016). Things go elaborately and spectacularly wrong when the Bruschetti brothers––Max, Sal and Enzo––decide to retire from the crime business, and New York actor Harry Murphy accidentally overhears their plans for murderously cleaning up some loose ends. Harry decides to warn one of the brothers’ targets, and the more the brothers try to clean things up, the messier they get. Not just for the brothers, but for Harry, for the beautiful and feisty British police agent whom Harry teams up with, and for various compatriots of the Bruschetti brothers, their other family members and law enforcement. The action careens around like a pinball arcade game, bouncing from one catastrophe to another, and back and forth between England and New York. The violence is frequent but not too graphic, the cast of characters is huge and colorful, and it’s easy to see this being turned into a caper/thriller movie. I’d have liked to see a bit more character development for Harry and the other main characters, and there is a sexual plot point late in the book that struck a big-time false note for me, but on the whole I found this to be an entertaining read and a winning first writing effort by McCallum. You might think that the category of crime fiction written by actors on very high-rated TV shows would be small, but I do know that McCallum isn't alone in it. Check out Hugh Laurie's The Gun Seller. Sure, he played the wildly popular Dr. House, but he's a heck of writer too. 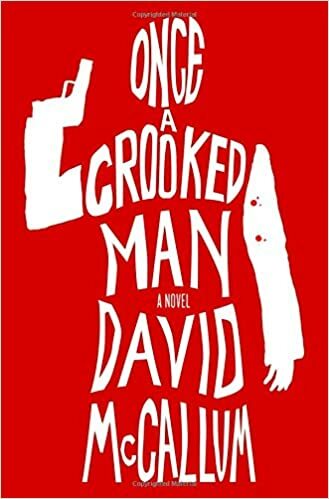 Note: Thanks to Minotaur for providing a free advance reviewing copy of Once a Crooked Man. Versions of this review may appear on Amazon, Goodreads, BookLikes and other reviewing sites, under my usernames there. Image sources: davidmccallumwiki, TV Guide, Amazon.com, Barnes & Noble.